A few weeks back, I did some cocktail experimentation for the LoMo Market, and I didn’t have the chance until now to link you all to the post on it. It was a lot of fun, and I love when I get the chance to prove I’ve learned something from this little food and drink blog of mine. 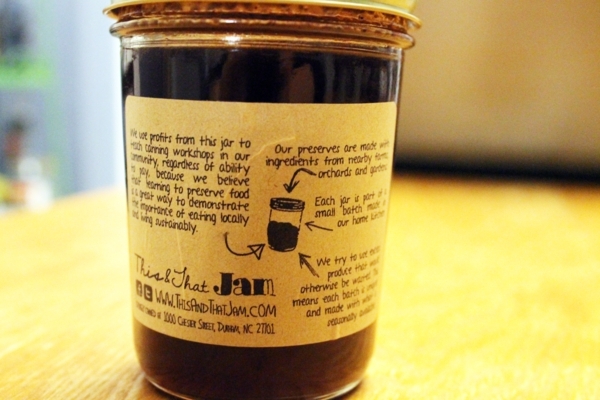 This and That Jam is a great local company that makes jams and other canned goods and uses part of their proceeds to teach canning to the community at large. Canning is a super valuable skill (one that I’m too lazy to learn) and an excellent way to reduce food waste. Part of how This and That Jam accomplishes that goal is to use produce that might otherwise go to waste and create products from it. I am charmed by their mission statements on the back of their jars. If you’d like to see the cocktails, make sure you visit their blog. Happy drinking!